Paithani saree gets its name from origin town Paithan in Aurangabad. This hand-woven sarees are made from silk. Their innovative pattern and board borders make them stand out from others. They have kaleidoscopic appearance unique as one colour thread is weaved lengthwise and another colour thread is weaved breath wise. They come in vibrant color combination o such as black and white, red and green with designs of flower, birds and geometrical figures. Paithani sarees are ideal for marriage and other occasions for their delicate motifs and traditional appearance. Kanjivaram sarees are one of the best dresses for the bride. Contrast borders which is of a different color from the rest of the saree gives a stunning look. Kanjivaram sarees are the south Indian version of Banarasi silk sarees. These sarees are available in different styles from simple to intricate zari works to rich and lush patterns. Kanjivaram sarees are considered auspicious. Another popular traditional saree is Banarasi silk Sarees which are hand woven and originates from Varanasi in Uttar Pradesh. They are the essence of artistic luminosity. 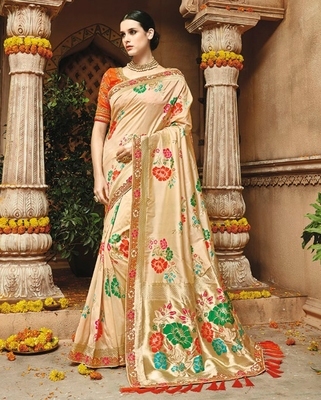 Gold and silver threads are woven on purest silk gives them a royal touch. Impressive flower and creeper design across the border called jhallar gives them a stunning appearance. Banarasi sarees are handed over from generation to generation for their emotional and authentic value. Muga silk originates from Assam, and the word muga means yellowish in Assamese. This silk is made from Antheraea assamensis (Muga silkworm) which is very delicate and cannot withstand pollution. Muga silk is the most expensive form of silk and comes in fine or crushed texture. Rich stitching in forms of flower, leaves, and trees gives it a fabulous and ethnic look. Patola sarees from Patan takes four to six months to get finished. The uniqueness of this saree is double ikat weave that is once it is finished both sides look same in texture, colour, and appearance which needs high precession. Khadi sarees are porous and more absorbent which makes them lightweight and breathable. Deep colour dyes suit it due to the absorbent nature of the fabric. Word Bandhani comes from the Sanskrit word banda which means to tie. The fabric is tied tightly with treads at different positions and then dyed. After the dyeing process, the knots are opened so that patch remains unaffected by dye and retains its original colour. Bandhani sarees are dyed in organic colours mainly of yellow, green, blue and black. Tant sarees are weaved in West Bengal which dates back to 15th century. Cotton threads are used for weaving of these sarees with beautiful thick borders. The lightness of these sarees makes it ideal for daily use. Pattu sarees originates from Kerala; it is glistening and classic and near to the heart of every south Indian woman. Gold plated silver zari embroidery gives it an authentic look. 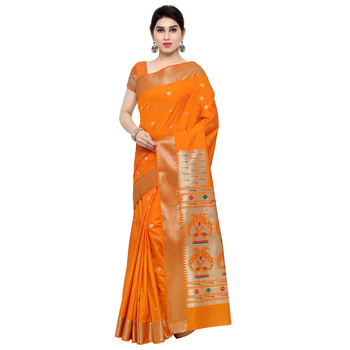 Modern pattu sarees are a fusion of contemporary design and traditional weaving. Traditional Sarees like Banarasi Silk Sarees are witnessing a global demand for their rich ethnic colours and intrinsic designs.